How much time passed between The Lion, the Witch, and the Wardrobe and Prince Caspian? The book series will nonchalantly say "hundreds" or "a thousand" or "thousands" of years in different places throughout, but is it ever stated exactly how much time passed between Peter, Susan, Edmund, and Lucy's first departure from Narnia and their first entrance back into it? In this Timeline which is generally believed to be accurate as some if not all are based on actual notes by CS Lewis. We see its been almost 1300 years since the Lion, the Witch, and The Wardrobe. 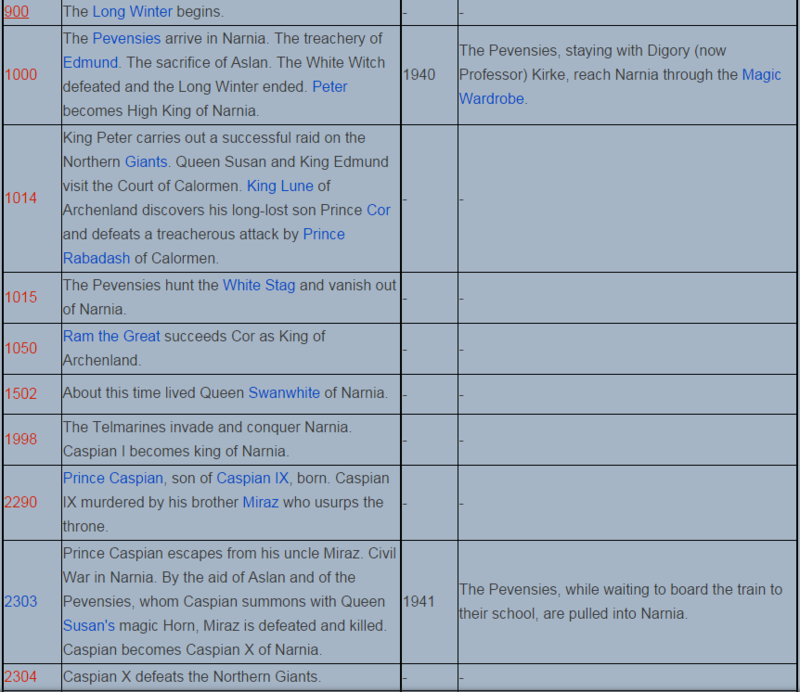 The events of The Lion, the Witch, and the Wardrobe occured [sic] between 1000 and 1015 NY [Narnian Year], and in 1940 AD on Earth. Due to the anomalies found between Earth time and Narnian, this story takes place in Narnian-year 2303 and Earth year 1941. Not the answer you're looking for? Browse other questions tagged time-travel time narnia or ask your own question. What is the time difference between Prince Caspian and The Dawn Treader? How can the time variations be explained in the first three books of the 'The Chronicles of Narnia'? Why were the crowds cheering Caspian, Aslan and the others? Why was Susan treated so unkindly? How much time passed between episodes 20 and 21 of Star Trek: Voyager season 3? How much time passed in the real world while Harry was at King's Cross in the final book? How did Lucy/Edmund travel multiple times to Narnia (in The Lion, the Witch and the Wardrobe)? What was the giant Time's new name in The Last Battle?